A forum for video games, new & retro, on consoles, computers, handheld & mobile. Also for tech talk, things like PC parts, phones etc. That is one series I’m shocked never left the PSX era. I never played it myself, but many people consider it to be one of the best games of that console. Most custom hardware is seriously locked down these days, with many corporations viewing any tinkering with their machines as unacceptable at best, illegal at worst. When people free computing hardware – so-called jailbreaking – it can be used for almost any purpose. The famous Cydia, for example, created a whole alternative iOS app store, one free of the constraints of Apple. Of course, jailbreaking has also become synonymous with breaking fundamental copy protection, allowing pirated software to run on a range of devices from cellphones to today’s cutting-edge games consoles. The flip side of that coin is that people are also able to run so-called ‘homebrew’ code, programs developed by hobbyists for purposes that do not breach copyright law. This ‘dual use’ situation means that two separate sets of communities get excited when exploits are found for key hardware. That’s been the case for some time now with two sets of developers – Team Fail0verflow and Specter – revealing work on a kernel exploit for firmware 4.05 on Playstation 4. In November, Wololo published an interview with Specter and two days ago received direct confirmation that the exploit would be published soon. That moment has now arrived. As noted in Specter’s tweet, the release is available on Github, where the developer provides more details. 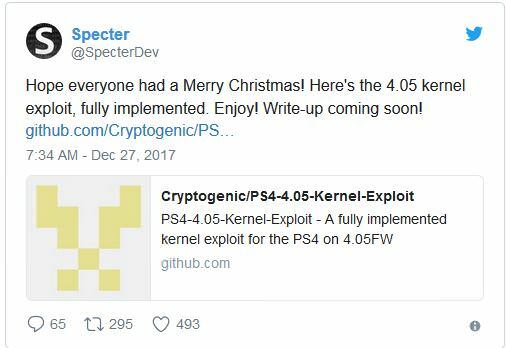 “In this project you will find a full implementation of the ‘namedobj’ kernel exploit for the PlayStation 4 on 4.05,” Specter writes. The news that the exploit can enable a jailbreak is huge news for fans of the scene, who will be eagerly standing by for the next piece of the puzzle which is likely to be just around the corner. Still, Specter is wisely exercising caution when it comes to the more risky side of his exploit – the potential for running homebrew and, of course, pirate games. He doesn’t personally include code for directly helping either. “This release however, does not contain any code related to defeating anti-piracy mechanisms or running homebrew,” he notes. That being said, the exploit clearly has potential and Specter has opened up a direct channel for those wishing to take things to the next level. He reveals that the exploit contains a loader that listens for a payload and once it receives it, executes it automatically. “I’ve also uploaded a test payload you can use after the kernel exploit runs that jailbreaks and patches the kernel to allow access to debug settings, just needs to be netcatted to the loader via port 9020,” he concludes. That’s likely to prove very attractive to those with a penchant for tinkering. Let’s see which direction this goes. Burnout Paradise, the 2008 Criterion games open world racing game, is getting a remaster which will be launching on PS4 in Japan on March the 16th. The listing was spotted by Gematsu, and the tentative title for the game is “Burnout Paradise HD Remaster”. Rumours of a remaster first surfaced in December of 2017, via Brazilian blog GamePress which stated that the rumours identified a PS4 and Xbox One remaster. We do not have details about a release outside of Japan at this time, but we will update this story as soon as we more details emerge. Is Burnout Paradise Still Burnout Paradise Without the Soundtrack? It’s coming, Burnout Paradise is getting a remake at long last, at least on the PS4. We’ll finally get to go back to that city, Paradise City, and drive really fast into billboards over and over and over and over and over again. It’s brilliant news because Burnout Paradise was one of the last of the truly great, and accessible, racing games. Since then racing games have either gone more GTA-y, or they’ve gone more serious. People have been crying out for a new Burnout, and if we can’t have that then at least we’ll have Burnout at its best, all shiny. But there may be a problem. You see this is something that doesn’t get talked about much in games, is that soundtracks when they’re produced using licensed music, tend to have fairly strict limits on how they can be used. Often, this includes a time limit on how long they can be used. This is why you’ll sometimes see some games disappear from market. We don’t know which games are affected by this, but for example, is this why you can no longer buy the original Prey which heavily featured Don’t Fear The Reaper? We don’t know, but the issues that surround licensed music might affect the soundtrack to Burnout Paradise’s HD Remaster. We won’t know until the game’s actually released, but it’s something to worry about and something to get confirmation on before putting money down on pre-orders. Just to be clear: every song you love from the original may well be in the remaster. But would Burnout Paradise still be Burnout Paradise without the iconic soundtrack? Imagine starting the game up and not hearing Guns and Roses, imagine not having Killswitch Engage pounding out as you hit top speed along the harbour, imagine not having Soundgarden playing when you’re skidding around corners. The unthinkable could also happen. What if, and I can barely write these terrible, fearful words. What if ‘Girlfriend’ by Avril Lavigne isn’t in the game? What would be the point of racing if you can’t do it to ‘hey hey, you you’? Why perform tricks or smash billboards or unlock shortcuts if you’re not going to find out whether or not Avril Lavigne likes your girlfriend? And to anyone rolling their eyes – you damn well know you skipped through all the other songs to get to ‘Girlfriend’ more than once. Don’t deny it. I know. If the original soundtrack isn’t present, whilst the structure of the game would remain – and make no mistake, it’s a damned good game – the soul of the game would be ripped out. You see the soundtrack, whilst often overlooked in videogames in favour of mechanics or visuals, is integral to the feeling that a game has. Dear Esther wouldn’t be Dear Esther without Jessica Curry’s soundtrack, FTL wouldn’t be the success it is without Ben Prunty’s sci-fi inspired melancholic tunes, Mass Effect wouldn’t be Mass Effect without the works of Jack Wall. Burnout Paradise would still be amazing, but it’s not Burnout Paradise without the soundtrack. So we’re amazingly happy that it’s coming, but before the party starts we need to get confirmation of the soundtrack. What music’s going to be in there, and if the original soundtrack isn’t present, will it be a ‘true’ remaster? Back when the PS4 and Xbox One were announced as x86 consoles, the internet became rife with speculation over potential hacks and swifter emulation. So far, not much has surfaced on that front, but this week console modders did manage to put a dent in the PS4’s armor, paving the way for homebrew software, PS2 backwards compatibility and even Linux installations. It seems that if you have a PS4 that is still running the 4.05 firmware, then you’ll be able to bypass Sony’s security. As Eurogamer explains, the developers behind the console hack managed to reverse-engineer Sony’s existing PS2 re-releases for the PS4, resulting in an installable wrapper that can allow users to play almost any PS2 game. Being able to run homebrew software also opens the door to run cracked games on the console, something that Sony will likely clamp down on. The catch of course, is that these hacks only work on version 4.05 of the PS4 firmware, which began rolling out in 2016. These security holes were patched in firmware version 4.06, which came out in November 2016. With that in mind, finding a console to execute this on is going to be very difficult, unless developers figure out a way to roll back firmware on the PS4. KitGuru Says: It was only a matter of time before someone managed to break the PS4’s protection to play around with stuff like this. Still, it’s not like this is something that just any PS4 owner can pull off, since you need a very specific (and old) version of the firmware first. Do any of you happen to have an old PS4 just laying around running the old firmware? I imagine these consoles are going to end up being worth a lot of money on eBay after this. That looks good and all, but I still think it’s an unnecessary remake. The original was just so perfect that I’m conflicted on if I really want to buy the remake. That’s a good PS+ lineup. I haven’t downloaded PS+ games in a while, so I’m glad there’s something good for once. It makes sense, though I hope they offer more PS4 games in exchange. Tonight I finished the main story of Yakuza 0. I haven't even started it yet.